University Book Haul | What Does Mel Think? So, I made it! A week has passed now and I am feeling WAY more settled than I thought I would be. 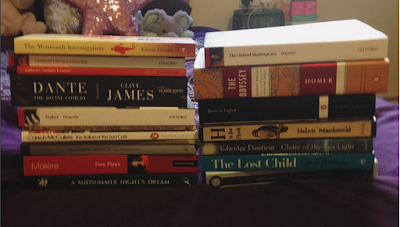 My classes don't actually start until tomorrow but as I was lucky enough to collect my books for the course, and I thought it would be rude not to share them with you! As you can see there is a lot of heavy reading in store for me. I am currently trying to wade my way through 'The Odyssey' which is very beautiful but also all consuming, definitely not a light read! However, I guess this is a great place to throw me in and I graciously accept the challenge. I have been dying to get around to reading Shakespeare's 'Hamlet' so I am thrilled that this is also on the course, Also we have some other classics: 'Midsummer Night's Dream' and 'Dracula'. But the other's seem a bit of a mystery to me. Collecting these books has made me really excited to delve into the course, I think it's important for any reader to visit the routes of literature (hence why I chose this course) and now I have the chance to. I am considering writing posts about a few of these books as I go if only to tempt those considering a Literature degree. If this is something you would want, let me know in the comments.